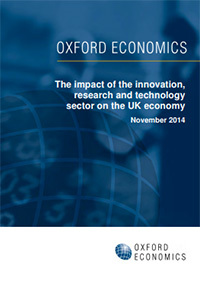 The innovation, research and technology sector continues to punch well above its weight in the national economy, as shown by an independent study commissioned by the Association for Innovation, Research and Technology Organisations (AIRTO). Carried out by Oxford Economics, the study reveals the sector has more than tripled in size since 2006, with turnover up from £1.9Bn to £6.9Bn over that period – despite the recession. Taking into account the sector’s induced and catalytic effects on the economy, the total impact is assessed at between £32Bn and £36Bn, equal to 2.3-2.6% of total UK GVA, achieved with just 0.3% of government spending. This unusually high impact ratio underlines the sector’s unique position in the national economy. Over 80% of the turnover generated in the innovation, research and technology sector originates from AIRTO members, who represent a network of organisations that is both significantly larger and responsible for a wider spread of activities than the equivalent Fraunhofer Institutes in Germany. AIRTO members also employ people in each of the UK’s twelve regions and devolved administrations, with more than half of employees located outside London and the South East. Complete the following form to download and view your copy of the report. We'd like to send you our newsletter to keep you up to date with news and events related to AIRTO and our activities. We'll always treat your personal details with the utmost of care and will never sell them to other companies for marketing purposes.